Well, Tristyn and I have been pretty busy this summer! I didn't really realize all the stuff we had done until I started this post. I thought it would be easiest to sum it all up with photos and a list. Met some real Slovenian relatives. Made new friends in the neighborhood and went to the Porter Co. Fair. Ate at Paradise Pup which was featured on Diners, Drive-Ins and Dives. Hung out in Kenosha, WI for a couple of hours. Rode a camel at the fair with Miles. Learned to ride a two wheeler. Jumped off the diving board...a lot. I saw former student Eric Gehrig play for the Columbus Crew. Took a family vacation to Michigan. Tristyn scraped her belly button?!?! Who does that? Saw Frozen in the park! Stayed up late and ate smores. Learned to take photos with an SLR camera. Went swimming at the Verpooten's and the neighbor's A LOT. On Martin Luther King Day I was lucky enough to spend time in Tristyn's class! We didn't have school and she was making up a snow day. I thought it would be really fun to help and observe her little class. Tristyn has a total of 30 students in her class. Her teacher, Mrs. Cruz, is a saint. I seriously do not know how that woman does it every single day. Thirty 5 and 6 year olds? The entire school is just for kindergarten. First thing when we walked in Tristyn has some breakfast. One at CHOA and another when she hops off the bus. We went back to her class and she got started on her morning work. Working on her morning work while waiting for the fire drill. Then there was a fire drill. I was so amazed at the quiet soldiers marching down the hall. Mrs. Cruz was quick to drop behavior colors on those who were talking. Overall, I was just in awe of how swiftly the kids transitioned to different activities. Directions were given and the children worked to follow them. I stayed to eat lunch with Tristyn. Mini corn dog day! My favorite. Mini corn dog day with Tristyn and her friend Hayden. 1. You have to be OCD organized to teach kindergarten. 2. Mrs. Cruz has a song for EVERYTHING. 3. It is amazing the things Tristyn can do for herself at school, but not at home...hmmmm. 4. Watching the intellectual growth of a kindergartner from day one to the end has got be a great feeling. 6. 5 year olds fart and think nothing of it. 7. I really don't think kindergarten teachers sleep...ever. 8. Kindergarten is way too colorful for me. 9. The first years in school are important. If a child starts off their educational career with a dud of a teacher...then they will have a sour outlook on school for the rest of their life. Scratch that. Every year is important and every teacher's attitude is important. Even though I teach high school, I can still be crazy and attempt to make my class somewhat enjoyable for teenagers. Hopefully, it will keep them coming back for more. Tristyn has been blessed with four amazing preschool and kindergarten teachers...Miss Janice, Miss Linda, Mrs. Kilar and Mrs. Cruz. I know that these ladies have launched Tristyn's educational adventure on the right track. 10. Kindergarten teachers use WAY too much Comic Sans. Mrs. Cruz is wearing her out too! Yesterday she fell asleep on the bus ride home. Except for the day when her walking tacos didn't walk. And her popcorn chicken didn't have popcorn in it. Yesterday she brought home her "Problem Solving Journal." I thought I would share some of my favorite entries. This is my favorite because the apple has a worm coming out and she made a word bubble for the worm saying, "yum." She spelled it all herself. This one just shows her personality so much. My kid with the purple icing on her cake. Sure the directions say, "I can draw a picture that shows 3." But a picture of a dolphin, a wave, and her surfing is much cooler. Tristyn wasn't sure how many people were in her family so she left it blank. She drew (from left to right) me, Aunt Barb with her white hair, herself and then started to draw Grandma, but she ran out of time. Sorry Grandma! This is her in a dress of course!!! 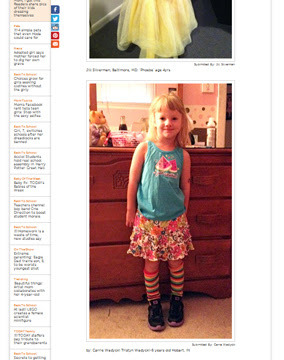 Oh yes...my kid made the Today Show website! It was a story about letting your kids dress themselves of course! My kid has great fashion. Actually, the photo I submitted was taken at the end of last school year. Her matching abilities are getting much better. I love how she expresses herself through her clothes. But as long as she is happy wearing what she likes..it's ok with me. As long as she doesn't look too ridiculous or is weather inappropriate. I hope she has the same excitement for the start of school every single year. 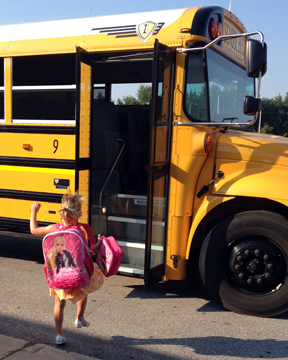 People have said that sending your child to school for the first time is hard. Tristyn has been going to school since she was 3 months old. It has never been hard for me. Maybe because she always loved the people taking such great care of her during the day. From Miss Cheryl to everyone at Caring Heart Open Arms...they made dropping her off a snap for me. My little girl isn't so little anymore. Holding her best friend's hand. She waited her turn to give her teacher, Mrs. Cruz an apple. And packed it in her bag. I think that might become a first day tradition. And at her seat around the red table. She immediately sat down and got right to work. A quick hug and kiss good-bye. No tears from Little Nug. Only smiles and total confidence. She's not a Little Nug anymore. It's corny to say, but she starts her educational career today. -Put forth your best effort and work hard at everything you do. -But don't stress so much about letter grades. -Always smile and be nice to others. -Education is one thing that NO ONE can ever take away from you, so learn as much as you can. I will be kissing her good-bye in her dorm room. Tristyn and I made a summer bucket list way back in May. Here it is and the highligted ones we actually accomplished! Miles and Tristyn at the 49er Drive In in Valpo. Feeding the goats at the Michigan City Zoo. Saying hi to the baby horse. Ok...so we didn't hit many things on the list. The weather was pretty cold and rainy this summer. And...I did have hernia surgery on June 11 that had me down for weeks. Here is a list of OTHER things we did that weren't even on our planned list. 3) Tristyn slept overnight at the Verpooten's house for 2 nights! I think she went on this slide about 8 times. Jeremy, Simone, Colette and Julia standing. Austin, Tristyn and Aidan. Sitting by the little house. Miles and Tristyn got to ride a camel at the fair! Yearbook distribution through the years. Little Drew Verpooten and our yearbook. 17) Went to Auntie Julie's ice cream party. Bacon peanut butter ice cream. We also painted a lot of nails, spent the 4th of July at the Verpooten's house, bought a fish, hung out at Lake George, and ate a lot of ice cream. Huh...I guess we did do a lot this summer! We decided to have Tristyn's birthday party a tad early this year. We also decided to have it at Bellaboo's in Lake Station. It is this amazing place for kids! They have themed rooms for the kids to play in that are just awesome. Tristyn's favorite room is the face painting room. She likes to paint her face like a tiger. She had a couple of friends from school come like Avery and Soleah. Cousins Austin and Adian were able to come from Illinois. Best buddies, Miles and Drew were there of course! And our neighbors Jacob and Vivian came along too! Jumping in the ball pitt with Miles. Concentrating on her birthday shirt. Face painting with cousin Austin. Her special bunny that she reaaally wanted and named Kendra.